The Grand Rapids Downtown Market will host the second “Culinary Conversations” Meetup on April 4 at 5 p.m., featuring Chef Tunde Wey. Wey is a Nigerian born chef, business owner and founder of the Blackness in America Dinner Series, who uses his love of food as a platform to shine a light on a multitude of racial injustices still prevalent in American culture. 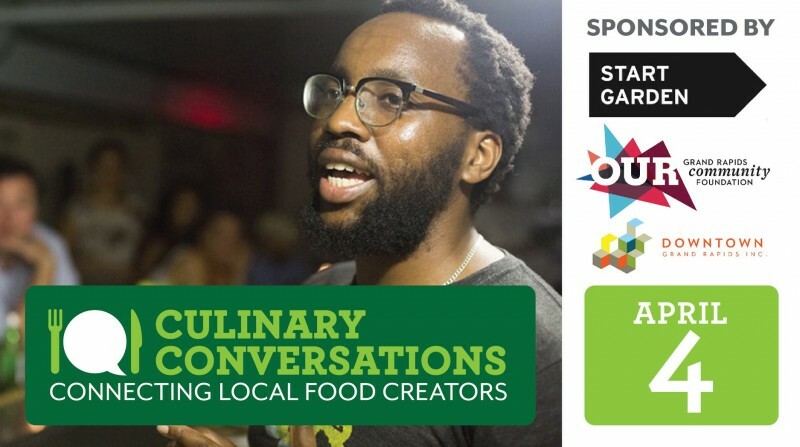 During “Culinary Conversations,” Wey will speak about a variety of issues including racial inequality, wealth disparity and the struggles he faces as a black chef and business owner. In 2016, Wey started the Blackness in America Dinner Series, which offered a chance for people to come together in 14 cities across the country to discuss how blackness intersects with their work and lives. His next projects explored anti-immigrant attitudes in the United States, starting with the Chinese Exclusion Act, as well as racial wealth disparities and their impact on food systems. His latest project popped up this past February in New Orleans, via a limited edition lunch counter called Saartj, where he served boxed lunches to people of color for $12, and to those who identified as white for $30. The $18 (2.5x) difference mimicked the racial income disparity in New Orleans. Culinary Conversations is a peer-to-peer collaboration and networking group for West Michigan’s food industry professionals, including growers, producers, chefs, bartenders, restaurant owners, entrepreneurs and others, intended to strengthen Grand Rapids’ regional food system. Led by the Downtown Market, Culinary Conversations is a unique partnership between Start Garden, GROW and Michigan State University Extension. Each monthly Meetup includes both networking and educational opportunities. Sponsors for April’s event include Grand Rapids Community Foundation, Downtown Grand Rapids, Inc., Start Garden and Invest Health GR. Link to registration for the event is at: https://www.meetup.com/Culinary-Conversations-Grand-Rapids/events/257189352/.